MELCO’S latest innovation, the FAST CLAMP PRO, is a versatile, adjustable, user-friendly clamping system designed specifically for AMAYA and EMT-16 embroidery machines, and is a must-have if you’d like to tackle jobs that are difficult to accomplish in a regular hoop. The FAST CLAMP PRO comes with three sets of arms, for varying depths of material, and quickly adjust to varying widths to fit designs as small as 3cm, to as wide as 23cm. The clamping arms are padded and height-adjustable, so that you can achieve a tight enough hold without marking the material or damaging zippers. Each clamping arm opens and closes independently, and have graduated marks printed on either side, so you can easily align and tighten your garment perfectly every time. 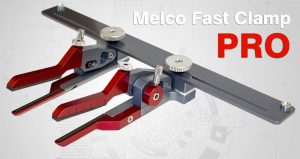 Contact us for more information, or to get your FAST CLAMP PRO today! If you already own a FAST CLAMP PRO, and are looking for installation/operation instructions, you can find those by clicking here.